Room Two is a king suite located on the second floor of the mansion. It has a wood burning fireplace and a view of the estate. The Wilburton Mansion contains elegant master suites and deluxe rooms, as well as the hotel’s library, living, and dining rooms. Mahogany moldings, four poster beds, down comforters, oriental carpets, and fine antiques are some of the signature features of these accommodations. Rooms offer stunning views of the Battenkill Valley and Green Mountains and the property’s stately grounds. This grand king room was the master bedroom of Chicago Railroad tycoon, Albert Gilbert, who built the mansion as his private residence in 1902. Gilbert was friends with Robert Todd Lincoln who built Hildene next door. Gilbert used his railroad fortune to turn this home into a 400 acre gentleman’s farm, the largest private estate in Manchester. This bedroom features a wood burning fireplace and high mahogany four-poster bed. There are dramatic views of the pines and estate from oversized windows. 2nd floor. 300 square feet. This sumptuous, sun-drenched suite is named for innkeeper Georgette "Gorgeous" Wasserstein Levis who turned the Wilburton into the premier destination for Vermont country weddings. Georgette felt her wedding at the Plaza Hotel was beautiful but too impersonal, so she ensured that every Wilburton bride felt like the princess of the castle. This romantic room features a high carved king bed, marble gas fireplace, antique maple furnishings and oversized chaise lounges to bask in the spectacular views. New spa bathroom with jacuzzi for two and separate Roman shower. 2nd floor. 400 square feet. 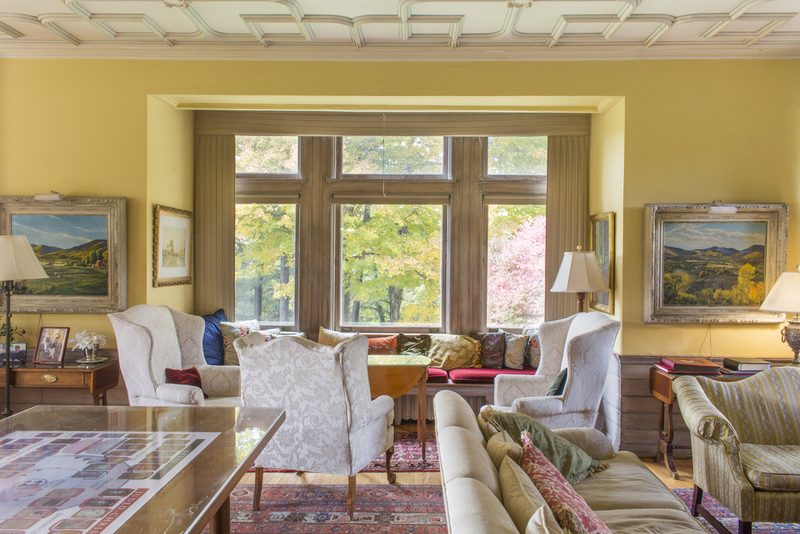 This stately king bedroom is named for James Wilbur who purchased the mansion in 1909 and renamed it Wilbur Hall. A Cleveland born, self-made millionaire, Wilbur paid for the first paved road in the state of Vermont. He built the Ira Allen Chapel at the University of Vermont and endowed a UVM scholarship that now exceeds $18,000,000. This light-filled bedroom feature a high king four poster bed and bay windows with majestic valley views. 2nd floor. 235 square feet. This delightful floral room features two queen beds. Yankee Magazine recently featured a full page photo of the Wilburton Inn's magnificent Christmas tree that has been decorated with love by three best friends who always stay in this room. Pam, Jewels, and Janice have been vacationing at the Wilburton twice a year for over a decade for their girls’ weekend getaways. We named this room in their honor to celebrate their beautiful friendship with each other, our family and staff. Large ensuite bathroom with bathtub/shower. Complimentary Wifi, Flat Screen TV, Hardwood Floors, Window A/C, 2nd floor. 230 square feet. This glamorous king bedroom evokes the elegant era when RKO Pictures owned the Wilburton Inn. The movie studio bought the inn as a secluded getaway for executives retreats and celebrity romances. You too will feel like a star, lounging on the red velvet chaise lounge, drinking in the spectacular Vermont valley views. This spacious room features an antique birds-eye maple king bed, marble gas fireplace and dramatic views of the valley. Complimentary Wifi, Flat Screen TV, Hardwood Floors, Window A/C, 2nd floor. 300 square feet. This gabled room evokes the charm of a Norman Rockwell painting. Rockwell lived in the neighboring town of Arlington, Vermont from 1939 to 1953. He painted many people who worked at the Wilburton Inn, most notably our housekeeper, Lucille Holton, who graced the cover of the Saturday Evening Post as the iconic red haired babysitter whose pigtails are being yanked by a baby. This room features a beautifully carded, double sized sleigh bed. 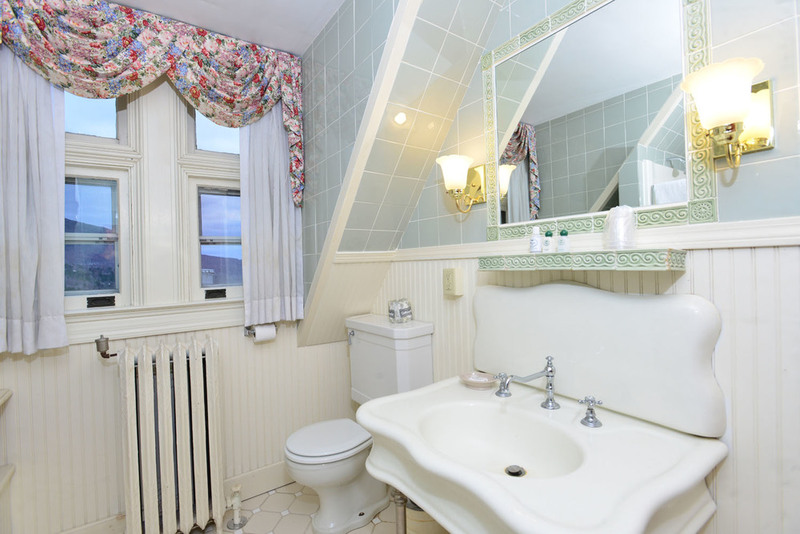 The private bathroom with a shower and antique Vermont marble sink is located across the hall. Complimentary Wifi, Flat Screen TV, Hardwood Floors, Window A/C, 3rd floor. 110 square feet. Innkeeper Melissa Levis felt like Eloise at the Plaza when she lived in this guest room for a year during her transition from New York City songwriter to Vermont Country Innkeeper. She loved waking up to the yellow floral wallpaper and climbing into the high four poster bed. The bejeweled pink pillows are a tribute to Melissa's prior life when the New York Post dubbed her "The Pied Piper in Pink" and she sang to thousands of children a year leading her band, Moey's Music Party. Queen four poster bed, lovely views of the estate. Ensuite bathroom with bathtub/shower. Complimentary Wifi, Flat Screen TV, Hardwood Floors, Window A/C, 3rd floor. 230 square feet. This lovely queen bedroom was named for Louise Gilbert, the daughter of Albert Gilbert who built the Wilburton mansion. She was the toast of the Chicago debutante scene until she made front page headlines and scandalized her family by running off on a steamer to Europe with another man! Her poor husband had recently bought land from her father and built her a neighboring 25-room mansion as a wedding present. That home, now called The Battenkill Valley Mansion, is once again part of the Wilburton Inn and can be seen from this window. A sunny queen bedroom with a high carved bed, chaise lounge and superb valley views. Ensuite bathroom with a shower/tub. Complimentary Wifi, Flat Screen TV, Hardwood Floors, Window A/C, 3rd floor. 230 square feet. This charming double room is named for the original Gods in Greek Mythology: Mother Earth, Father Sky, and their child, Time. Innkeeper Dr. Albert Levis was born in Athens, Greece. The repetitious pattern in the Greek myths inspired his discovery that psychology is a natural science. He bought his first home in Manchester in 1972 as a training center for his ideas and named it Earth Sky Time. His son Oliver turned Earth Sky Time into a thriving organic farm and bakery (and makes the delicious breads served for breakfast at the Wilburton Inn.) The view from this gabled room overlooks the valley near Earth Sky Time farm. Ensuite bathroom with a shower. Complimentary Wifi, Flat Screen TV, Hardwood Floors, Window A/C, 3rd floor. 180 square feet. This double room once was a dorm when Wilbur Hall became The Windsor Mountain School from 1940-1944. Educators Max and Gertrud Bondy fled Nazi Germany and established a progressive school in Windsor, Vermont. 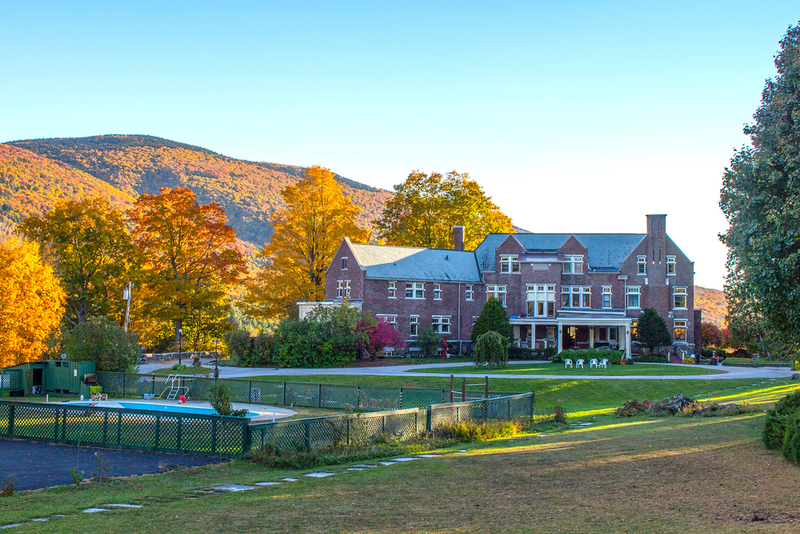 After four years in residence at the Wilburton, Windsor Mountain School moved to Lenox, MA where it ran till 1975. Their curriculum emphasized a love of music and Harry Belafonte and Thelonious Monk sent their children to the school. This cozy room features antique carved headboard, double bed and view of the estate. Ensuite bathroom with a shower. Complimentary wifi, flat screen TV, Hardwood Floors, Window A/C, 3rd floor. 100 square feet. This spacious queen bedroom has beautiful views of Hildene meadows and the grand estate that was the home of Abraham Lincoln's son, Robert Todd Lincoln. Like Albert Gilbert who built the Wilburton, Lincoln was one of the many Chicago natives who summered in Manchester at the turn of the century. The brand new sport of golf at the adjoining Ekwanok golf club was the primary draw for these Victorian gentlemen and ladies. Gracious queen bedroom with high carved bed, antiques, and beautiful valley views. Large ensuite bathroom with bathtub/shower. Complimentary Wifi, Flat Screen TV, Hardwood Floors, Window A/C, 3rd floor. 240 square feet. 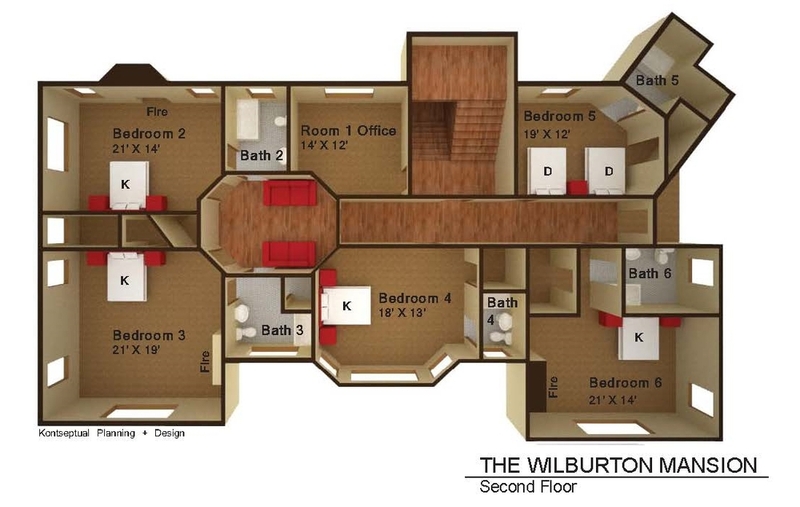 Click on the floor plan image to enlarge it.